Learn how to setup your block snap points to make EasyDraw easy! 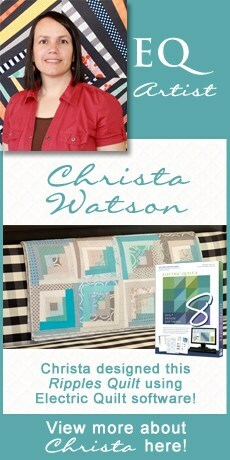 Finish off your quilt with a quilt label designed in EQ7. You’ll have fun using the Auto Borders tool, the Applique Text tool, and the Photo Layout! Drawing flying geese could not be easier! Draw a single line and let EQ7 create the geese! Or, instead of flying geese, turn your line into a row of diamond shapes! With the new Image worktable, you can create beautiful masterpieces with your photos right in EQ7. Apply Effects to turn your photos into a watercolor painting, or even make it look antique. There are 47 effects you can apply to your photos — have fun!! Export high-resolution images of your quilts or blocks for print publications or teaching materials. Or, export web images for your website or blog. Create sewing instructions by exporting blocks from EQ7 to pull apart for your instructions. Get a general overview of Electric Quilt 7. Watch a quilt be designed from start to finish. See pattern options available in EQ7.